February 14 is Valentine's Day. 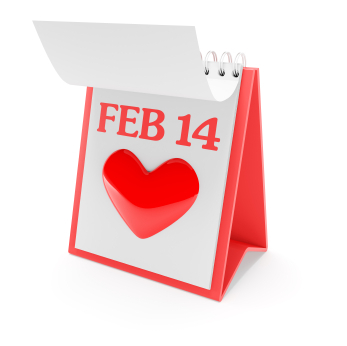 How do you plan to show your special Valentine that you love them? Dr Chapman, author of The 5 Love Languages, says that you should consider non-material ways of saying you care—not only to save a few dollars, but because many people take greater satisfaction from non-material ways of expressing love. Dr Chapman was a marriage counsellor for 30 years and he noticed that each of his clients had a “love language,” a primary way of expressing and interpreting love. He identified five of these love languages: Words of Affirmation, Quality Time, Receiving Gifts, Acts of Service, and Physical Touch. You can work out what love language you speak by taking a sample of Dr Chapman's quiz below. By understanding how you and your partner interpret and express love, you may be able to better understand and please each other. I like to receive love notes from my partner. I like to be hugged by my partner. I like to spend one-on-one time with my partner. I feel loved when my partner gives practical help to me. I like it when my partner gives me gifts. I like leisurely visits and long trips with my partner. I feel loved when my partner does things to help me. I feel loved when my partner touches me. I feel loved when my partner puts their arm around me. I feel loved when my partner surprises me with a gift. I like to go almost anywhere with my partner. I like to hold hands with my partner. I feel loved when my partner tells me they love me. I like to sit close to my partner. I like for my partner to tell me I am attractive. I like to spend time with my partner. I like to receive little gifts from my partner. Words of acceptance, especially from my partner, are important to me. I know my partner loves me when they help me. I like being together and doing things with my partner. I like it when my partner speaks kind words to me. What my partner does affects me more than what they say. Hugs make me feel connected to and valued by my partner. I value praise from my partner. Small, meaningful gifts from my partner show me how much they care. I feel close to my partner when we are talking or doing something together. I feel closer to my partner when s/he touches me often. I like for my partner to compliment my achievements. I know my partner loves me when they help me with something they hate. I like to be touched as my partner walks by. I like it when my partner shows genuine interest in what I am saying. I feel loved when my partner helps me with jobs or projects. I really enjoy receiving gifts from my partner. I like for my partner to compliment my appearance. I feel loved when my partner takes time to understand my feelings. I feel secure when my partner is touching me. When my partner runs errands for me, it makes me feel loved. I appreciate the many things that my partner does for me. I like the thoughtful gifts that my partner makes for me. I really enjoy the feeling I get when my partner gives me undivided attention. I really enjoy the feeling I get when my partner does chores for me. I feel loved when my partner celebrates my birthday with a gift. I feel loved when my partner tells me how important I am to them. I know my partner is thinking of me when they give me a gift. I feel loved when my partner helps with my chores. I appreciate it when my partner listens patiently and doesn’t interrupt me. I never get tired of receiving gifts from my partner. I like knowing my partner is concerned enough to help with my daily tasks. I enjoy taking trips with my partner, no matter where we go. I enjoy kissing & cuddling with my partner. I enjoy surprise gifts from my partner. My partner’s encouraging words give me confidence. I like to watch movies with my partner. Gifts from my partner are always special to me. I love it when my partner can’t keep their hands off me. I feel loved when my partner enthusiastically helps me despite being busy. I feel loved when my partner tells me how much I am appreciated. I love hugging and kissing my partner after we’ve been apart for a while. I love hearing my partner tell me that they missed me. When you’ve finished, count the number of times you wrote down each letter. One or two of them will be more dominant than the others. That letter (or letters) represents your primary love language!